A new app called TwIM has been launched for iPhone users that focuses solely on Twitter Direct Messages. It essentially houses all your Twitter DM conversations, lets you manage them separately, sends you notifications for a new message, and even lets you do a few extra things that you won't see on the Twitter app. The app supports iOS 10's new features like SiriKit, 3D Touch, and rich notifications as well. 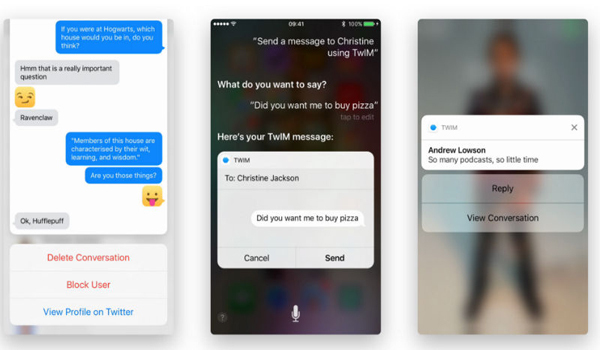 The SiriKit integration means you can use Siri to tell TwIM to send a DM to a specific person on Twitter, without opening the app. It also supports 3D Touch and rich notifications, which means you can expand notifications and reply to them directly. Applying pressure on the app icon will also enable different options, most of which are directly opening frequent or recent DM chats. To get the TwIM app up and running, you need to login using your Twitter credentials, and give it a few permissions (like Siri integration, Push Notifications etc), and you're good to go. The interface is fairly simple, and it just lists out all the users you've DM-ed with (with their profile picture) recently. It lets you share photos with other Twitter users, and even lets you send your current location - something that isn't possible on Twitter. The location will reach users in the form of a link (to all those users who don't use TwIM), and it will open on Google Maps or Apple Maps (whatever is set as default) directly. Also, the emojis have been redesigned to show up in a square shape in the chat dialog box, something that TwIM developers are calling TwIMoji. The app is similar to what Messenger is for Facebook, providing a separate space for all personal messaging. If you're an avid DM user, you should consider the TwIM for better experience of personal chatting with Twitter users. Its worth noting that the app isn't made by Twiiter, but by developers from Project Dent. For now, it is only available for iPhone users, and there's no word on availability for Android or Windows users. You can download the TwIM app from the App Store.